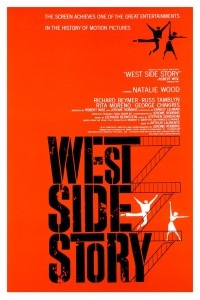 Roger Ebert: What I loved during "West Side Story," and why I recommend it, is the dancing itself. The opening finger-snapping sequence is one of the best uses of dance in movie history. It came about because Robbins, reading the screenplay, asked, "What are they dancing about?" The dancing and the music are indeed amazing and iconic, but the drama is a bit...slow-ish? And perhaps a bit overwrought? But still a very worthy movie. And for some reason, I always kind of have a "wha?!" in my brain when I realize that Robert Wise also directed the first "Star Trek" movie. A kind of cognitive dissonance, in a way. I was in the play when I was 15 (totally inappropriately! I played Consuela, one of the Shark girls even though I was the whitest blonde girl) and I felt the same way as Rita Moreno - the music is beautiful, but a lot of the dialogue is so cringeworthy, and even 40 years later, we could tell it was "old farts" writing how they thought teenagers talked. But the music is amazing. And I love that you can hear Sondheim's genius developing in some of the lyrics: When You're a Jet, Gee Officer Krupke. This was his first work on a Broadway show. I have such fond memories of that production. It's really fun for teenagers to do. One of my favorite weird NYC things is how the subways, when they start moving in the station, sound like the opening bars to "There's a Place for Us." Like the people in the article, I always wondered if I was just imagining it! A film that could only be improved had he added songs and fight-dancing. I first saw this film when I was 12. I was a young Filipino immigrant who had just moved to America 3 years earlier but my parents couldn't land permanent residency, so we were already making plans to move again and try our luck in Canada instead. It was summer and we were on a 3 week road trip where my dad just decided to work a loyalty program and check us into the same chain of hotels throughout the entire trip, and, strangely West Side Story was one of the movies on rotation. So, my siblings and I watched it in every stop until, by the third week, we were making up lyrics to "America" or "Anita's Song" in the car. As an immigrant from a Spanish accented country, it was one of the first films that I really felt like was written for me. Puerto Rico is a different place than the Philippines, and their history is similar but different to ours, but still, the way that Maria and Anita would talk about love, trust, and hate, or the back and forth between Anita and Bernardo about missing and hating home, all of that echoed what my family and siblings were grappling with every night. And god, I had such a young, fierce crush for Rita Moreno. If the internet existed in the 80s, I would've written Anita fanfic for days. Living in Boston, I'm particularly psyched that this year is Bernstein's centenary, and so the BSO and Pops have been doing a heavy focus on his oeuvre this spring and summer. They're showing the movie at Tanglewood later this month with live accompaniment from the Pops and while the summer is already feeling a little too full for a daytrip like this, I still keep coming back to that page and letting my finger hover over the Buy Tickets button. oh, and also, I don't know how commonly this is known, but I only realized it last year after I was doing a fresh round of research on the play after my wife and I watched a student production at our local music college -- but West Side Story was revived in New York in 2009, and for the revival, co-authors Arthur Laurents and Stephen Sondheim chose to translate some of the Sharks songs into Spanish and hired a then up-and-coming, freshly Tony awarded Lin Manuel Miranda to help them write the new pieces. For whatever reason, the very first thing I think of when I hear "West Side Story" is Robert Klein's routine on how an attempted watch sale on the street turns into a number from WSS.